The stories over the weekend about the paid book review service has sparked a lively debate around the web on whether any reviews can be trusted. With the revelation that successful indie authors like John Locke had sunk to the level of buying reviews, many are wondering what can be trusted anymore. One Reddit user studied the patterns of reviews on Amazon and put together the following chart. He's identified several warning signs in the reviews including how to tell that the bulk of the reviews are paid as well as when the only positive reviews were probably posted by friends and family of the author. The chart is below, but I wouldn't read too much into it. A number of legitimately popular books like the 50 Shades series have a spike of 5 star reviews with a tapering of 1 to 4 star reviews (though the first title in the trilogy does have a spike in 1 star reviews). In any case the chart is good for a chuckle. Newspapers Should Get to Know Their Customers…But Can They? 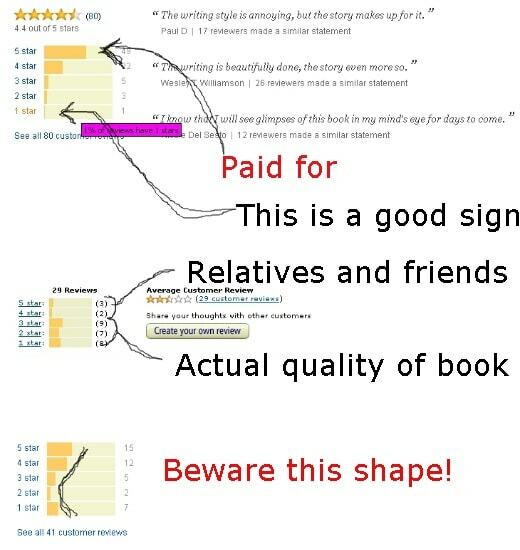 Too much weight put by people on reviews in book buying decisions. Generally reviews are about visibility and buying them is buying visibility; maybe unethical but not that different compared to what the big publishers do when they buy the best spots in bookstores, promotions and all, as well as when they strongly suggest major print review sites what to review, so all this fuss is meh. “He emailed me last week to report that he couldn’t stop turning the pages. But he still didn’t understand. Why was “The Art of Fielding” more “literary” than “The Hunger Games”? Nothing new under the sun again, just that in the past things were done underground by the big players. Unless the book is or was ever priced higher $9.99, in which case 90% of the 1 star reviews are from price protesters who haven’t even read the book. Amazon Vine reviewers tend to be more positive than the average consumer — even the ones which try to be fair. That’s just the way it is. Any review is better than no review. That’s the main problem I find with Amazon.com, BN and smashwords. So many potentially good ebooks are unreviewed. I often find myself writing the first reviews of books (mostly out-of-print ones). I don’t mind positive or biased reviews AS LONG AS THEY CONTAIN USEFUL INFORMATION. After something receives 10 or so reviews, you no longer need information; you need opinion and reactions. I’ve written a lot about the “reviewer problem.” One problem is that if you are not the intended target audience, your review isn’t likely to be meaningful or useful. I could write a harsh review of some genre fiction, but ultimately my opinion doesn’t matter because I don’t generally read genre fiction. Similarly, the book with the worst reviews may not necessarily be bad — just inappropriate for the reviewern who received a review copy. If a friend of the writer has good things to say about the book, that may be useful information if the friend has similar literary tastes to my own to begin with. Personally, when I review fiction by writers I know personally, I find that my reviews are harsher than they normally would. Sometimes Vine reviewers are way offbase though because they don’t understand what the novel is trying to do. (Established reviewers at least try to understand the novel’s aim). I’ve noticed that established reviewers are more inclined to review print copies and by name-brand publishers (with the budgets to send out review copies). From my list of people I consider to be the best book reviewers around, most of them never or rarely review an ebook title. How infuriating! I am wary of a bunch of 5 star reviews all with the same date. This is particularly noticeable when the book was just released. gush general praise, but actually discuss the content of the book. One star reviews need to be scanned for criticism of the content of the book, not price, or, “It wasn’t what I expected/wanted.” Some problems don’t automatically disqualify the book for reading, but may give me more realistic expectations about the book. Don’t you think that possibly one should take the content of the reviews into consideration rather than just the quantity and distribution? According to these criteria the only trustworthy scenario is a predominance of bad reviews. Anyone who’s spent any time reading reviews can tell an honest review from a shill job at a glance. Good reviews (whether positive or negative) are about content-centric opinions and evaluation, and it’s easy enough to know if the reviewer has actually read the book and given it some thought by reading the actual review. Shills stand out by their lack of any substance and broad generalizations and vague statements that can apply to almost any book. The criteria given here is like a shill review of reviewers, without any actual content.